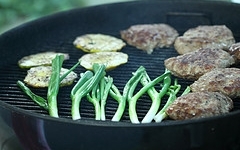 I have more than just a recipe for grilled chicken burgers, check out more recipes at the end of the page. I make these chicken burgers a lot. Why? Because they are so juicy and delicious. I stuff these burgers with cranberries, and top with stuffing and gravy during the winter. I also melt cheese (use your favorite) on top of these beauties.